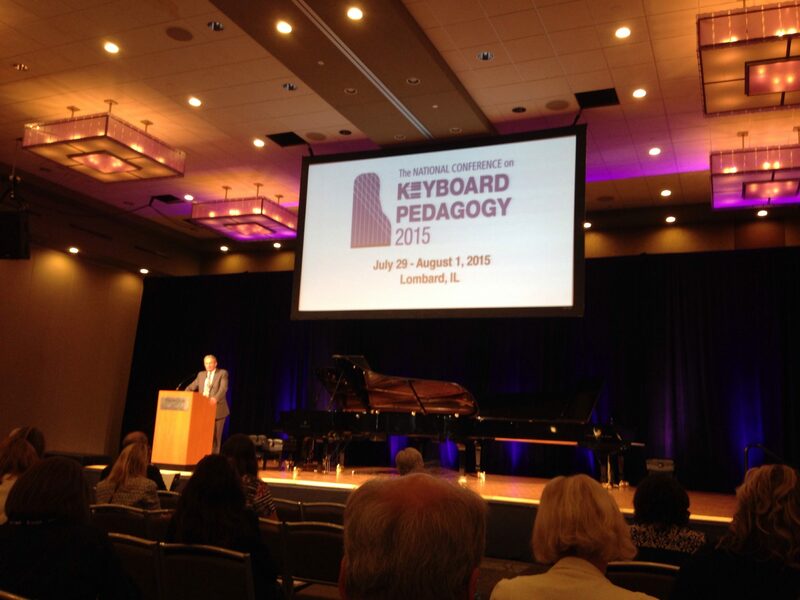 Yesterday’s pre-conference sessions at 2015 National Conference on Keyboard Pedagogy were outstanding, and the sessions on the official first day of the conference were just as great! Here is a summary of some of the events. First thing in the morning, I attended a publisher showcase by Korean publisher Sekwang Music Publishing Company. Lea Kang led us through a wonderful demonstration of the arts and movement activities of her new books called “Smart 8.” The book is completely unique from anything I’ve seen before. To be clear, it is not a piano method; rather, it is an integrated arts book that I think would be very fun and wonderful to use for offering group pre-piano or arts appreciation courses to young children. The beautiful book is filled with artwork to admire, think critically about, and experience through movement and music activities. The author enthusiastically led us through a series of the movement activities, some of them involving props such as scarves, ribbon wands, and hand-held music instruments. Today, I traveled with my good friend Susan West to Lombard, Illinois to attend the 2015 National Conference on Keyboard Pedagogy. 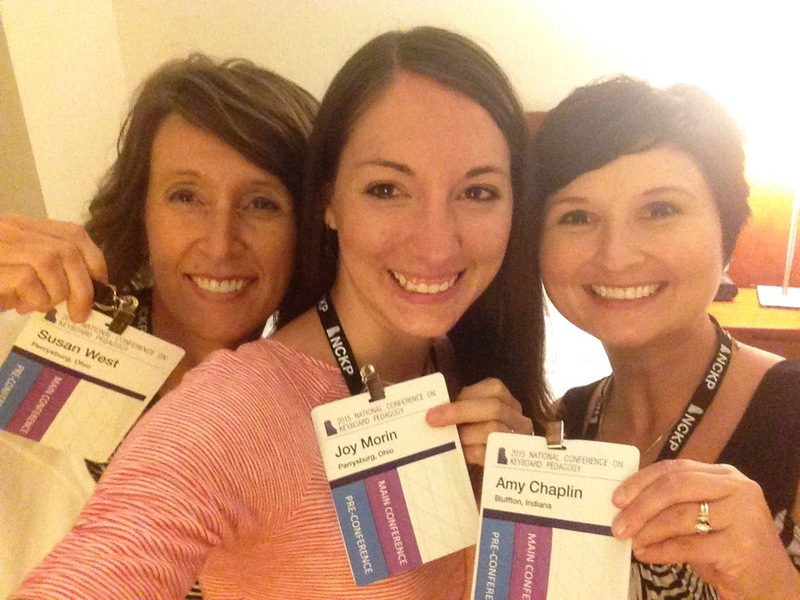 When we arrived, we met up with our other roommate, Amy Chaplin. We attended the Independent Music Teachers track of the Pre Conference Seminars. I recently finished creating a new set of technique charts for the RCM’s new 2015 Piano Syllabus. Over the past few years, I have entered a handful of piano students to take assessments through the Royal Conservatory of Music, an excellent program originating in Canada and becoming more popular in the United States. I appreciate the thoroughness of the assessments, which require students to perform a set of pieces ranging in musical styles and to demonstrate musicianship skills (sight-reading, ear training, rhythm exercises, etc.). The levels outlined in the syllabus (find the free PDF here) are soundly structured and have been refined over time by dedicated pedagogues in our field. RCM is also known for the quality and consistency of the adjudicating across the continent. RCM is not a competition; it is a standard that allows students and parents to better understand and track progress during music study. Every seven years, the RCM piano syllabus is revised to incorporate new repertoire, eliminate repertoire that is no longer readily available, and refine the musicianship and technical requirements. 2015 marks a revision year, which means RCM teachers are seeking to learn about the updates and changes compared to the previous 2008 syllabus. RCM’s non-profit publishing company, Frederick Harris, publishes a variety of wonderful books to aid students in preparing for assessments (most notably, the piano literature books known as the Celebration Series). Books are also available containing the notated technical requirements for each level; however, I personally prefer to teach scales/arpeggios/chords by rote rather than through having students read the notation. But it can be cumbersome to write out the RCM technical requirements on students’ assignment sheets each week–especially if you expect students to review all previous material. So, a few years ago I released a free printable containing charts of the technical requirements for each level according to the 2008 piano syllabus. These charts have proved to be incredibly helpful to ensure that my students are learning and reviewing all of the required technical work. I’m happy to announce today that new charts are available below for the new 2015 piano syllabus. Even if you have no intention of sending students to RCM assessments, you might find these charts useful. I keep this PDF uploaded on my iPad (use iBooks, GoodNotes, or any similar app of your choice) so I can print the appropriate charts wirelessly during lessons. Students take their chart to and from their lessons. As each item is mastered, we fill in each box with a checkmark or a sticker. The chart makes it easy to visually track progress. Special thanks goes to fellow piano teachers Donna Gross Javel and Nancy DeHaven Hall for helping to proofread the charts against the 2015 syllabus.